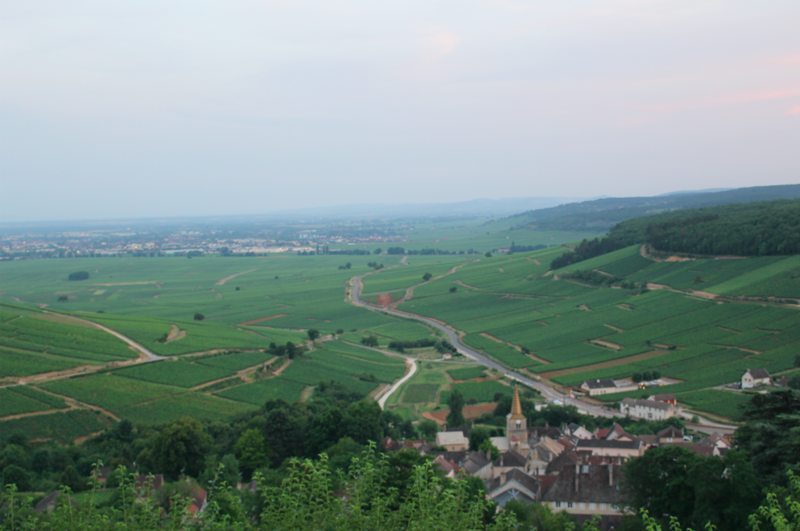 It is often said that travelers to Burgundy don’t simply visit the region, they experience it. And it’s true. 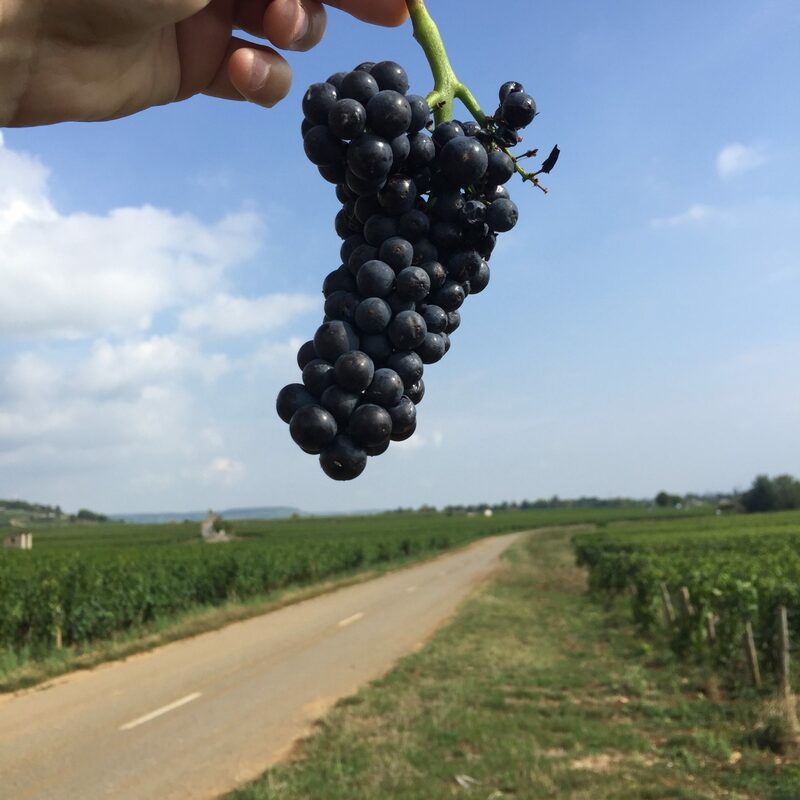 There is simply so much to see and do throughout the whole Côte d’Or that no matter how many times you come and go, there’s always something new and exciting to experience because Burgundy evolves with every vintage. Especially during Harvest. Sitting back with a glass of fine wine, relaxing, and watching Harvest happen is undeniably beautiful. But, getting your hands dirty and participating in the harvesting of the vines is even more rewarding and unbeatable. Trust us, we’ve been doing it since 1726! For the second year running, our Harvest Experience is now all yours to discover. 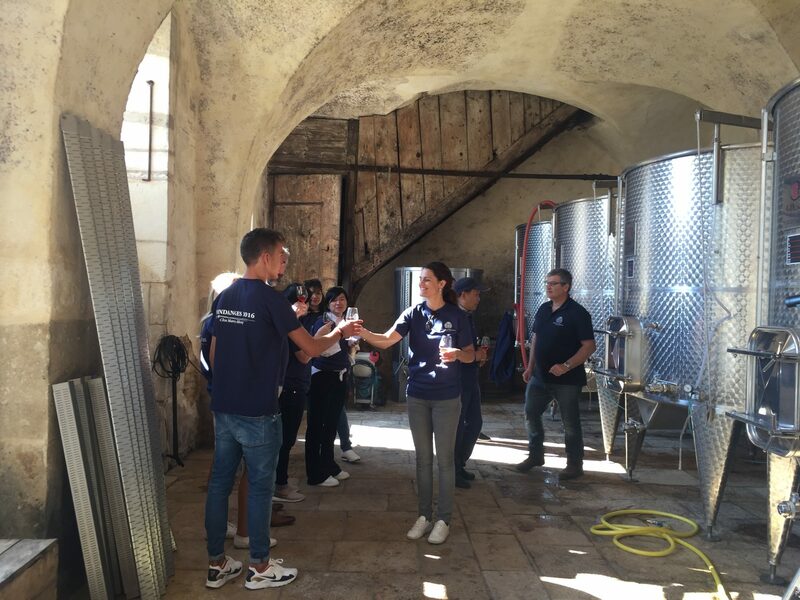 Hand-pick grapes in Clos Marey-Monge, sort grapes in the Cuverie, taste fresh juice from the fermentation tanks and immerse yourself in the world of a traditional Burgundian Harvest – you can do it all! 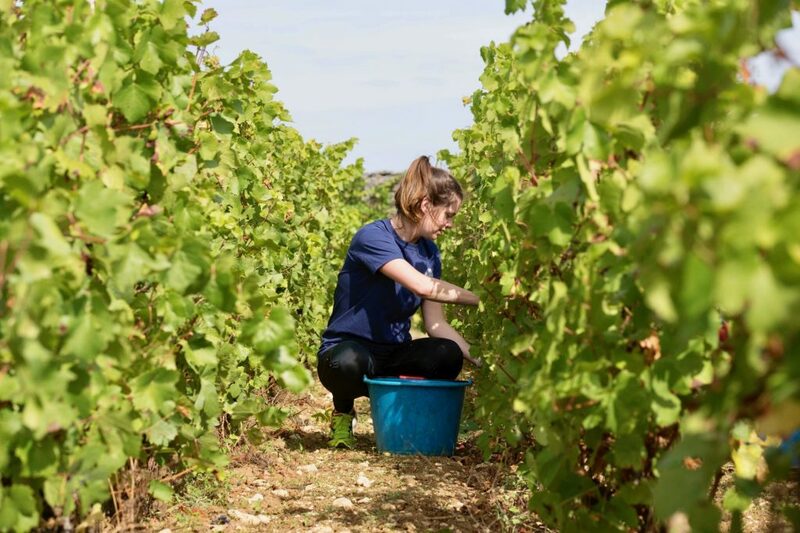 A Burgundy Harvest is a once in a lifetime experience that many Burgundians, and passionate wine lovers, are lucky enough to enjoy every vintage. The whole Côte d’Or comes alive at Harvest time. There is a vibrancy and vitality that is undeniably addictive. Tourists, travelers and locals come together, unite, and share in the experience as a singular soul. Vineyards blossom with wine lovers from all over the globe, wineries dive headfirst into a few weeks of hard work and organised chaos and appellations and villages bustle with traditions and celebrations. And, of course, there is much talk of vintages young and new, and wine, past and present. To see Harvest like nowhere else in Burgundy, reserve your spot on one of Château de Pommard’s six immersive and entertaining Wine Experiences including our dedicated Harvest Experience. Beaune boasts a year round calendar of entertainment and events. 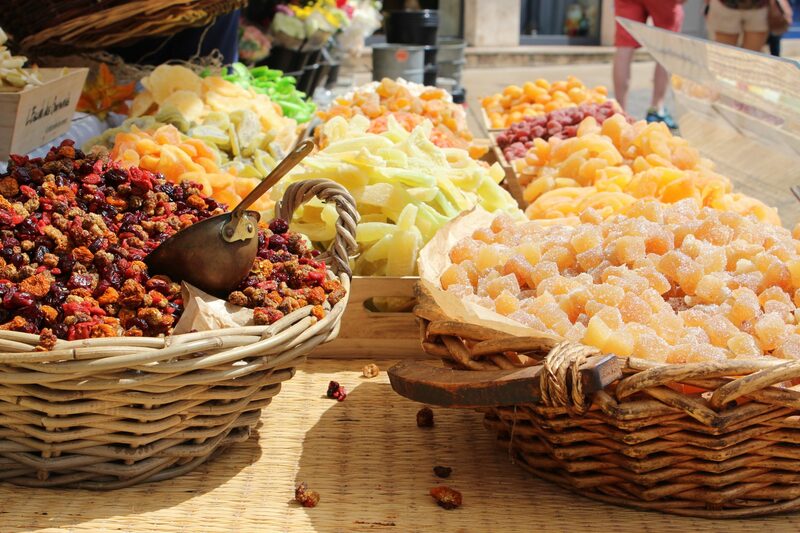 But it is during the Harvest season that there is something special in the air that makes Beaune’s world-famous market even more delightful. 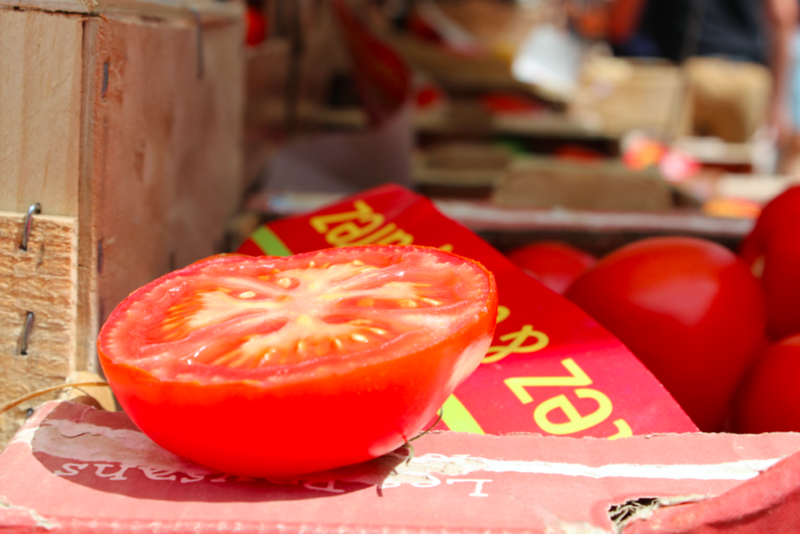 The produce, the people, the wine, the atmosphere… All these elements combine to make Beaune’s colourful market a genuine traditional Burgundy experience not to be missed. 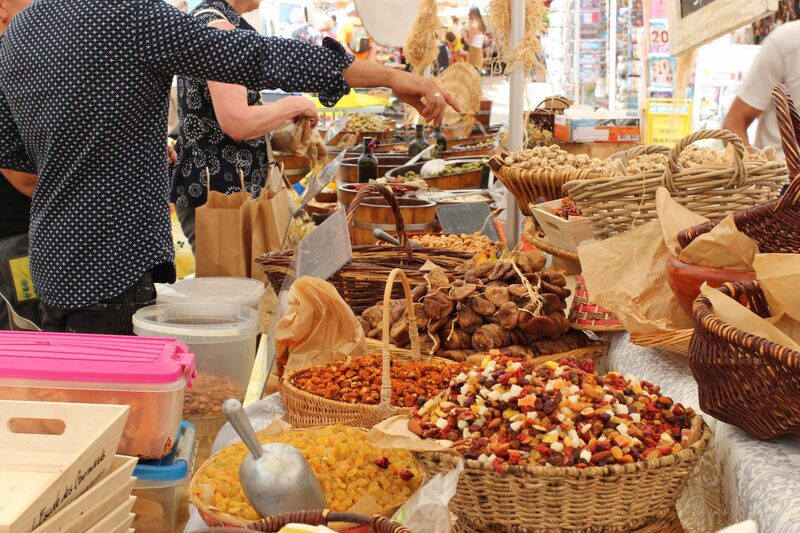 Held every Saturday, Beaune Market is set up and ready to serve travelers, locals and tourists from early in the morning. So if you’re thinking of going arrive in good time to ensure you see all the sights before they get packed away, usually just after 2pm. From Epoisses cheese, and other Burgundian cheese stalls ; tongues will salivate at the sights and smells of fresh pizza vans, fresh eggs and herbs, local honey, organic meat, Bresse rotisserie chicken, fresh vegetables, homemade soaps, antique stalls, as well as juice stalls and coffee stands… The perfect morning location you won’t mind getting lost in. 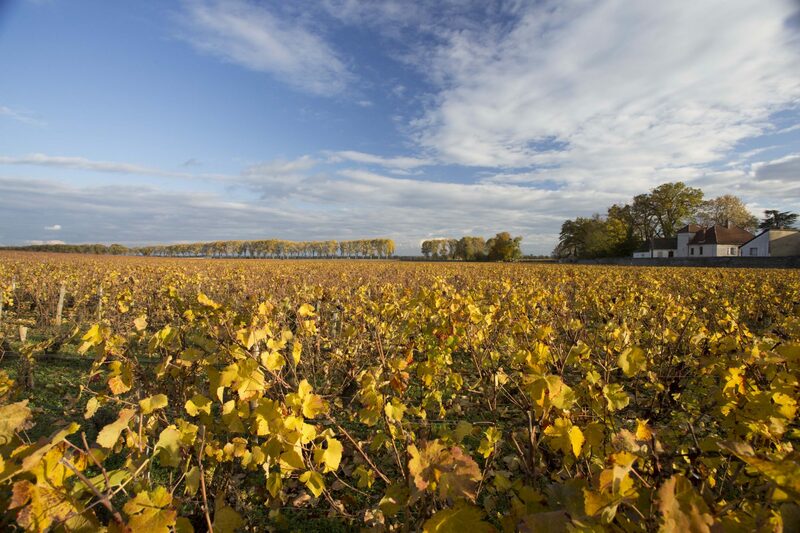 In 2015, Dijon and the Climats of Burgundy (including Clos Marey-Monge) received a UNESCO World Protected Heritage Site for their Excellent Universal Value. We’re surprised it took so long, considering wine and other things have been made here for more than two millennia! Dijon, the administrative capital of Burgundy, is an ancient province with many attractions for every type of Burgundy lover. The Palace of the Dukes of Burgundy is awe-inspiring, as is Notre-Dame Church, built in the 13th century. 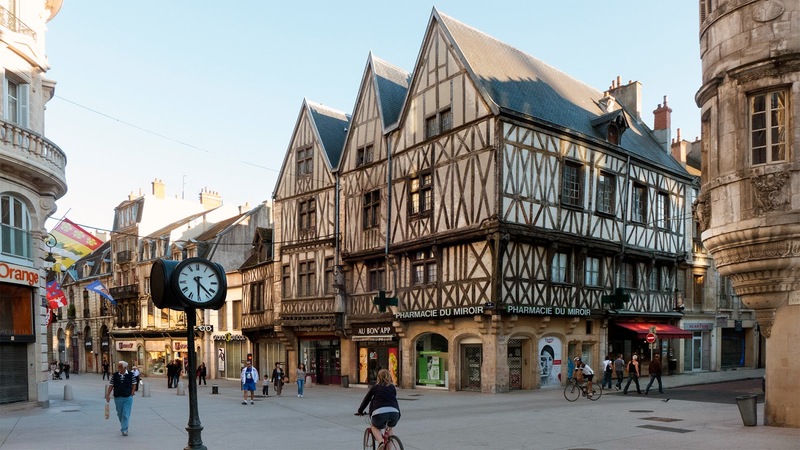 The narrow old streets, such as rue Verrerie has half-timbered houses and Burgundian-style roofs, time-honored places to stop and think about the pioneering architecture that developed and originated here in the 15th century. However, perhaps our favorite spot of all in Dijon is at The Côte d’Or Archive Department. 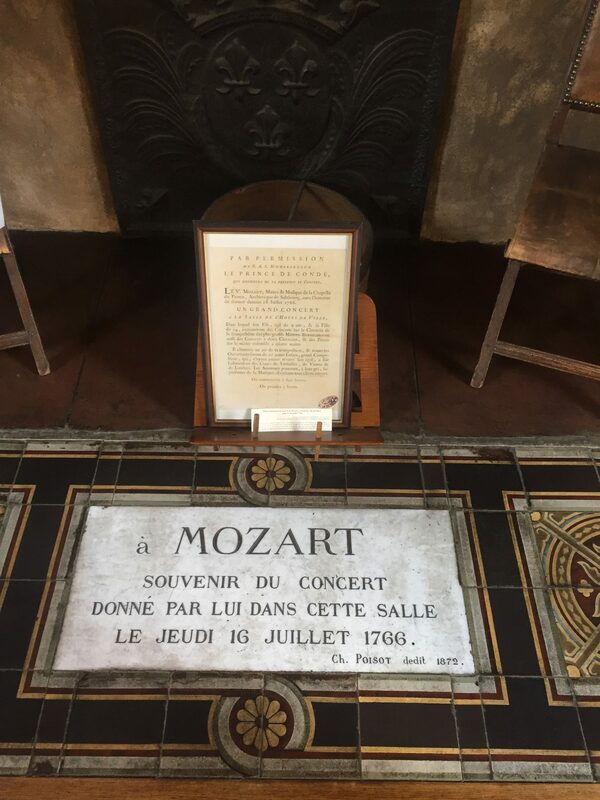 Here, you can stand on the precise spot a young Mozart played a crucial concert in July 1766, some 40 years after the fledgling Château de Pommard winemaking empire started. The spot will send shivers down your spine. At Château de Pommard, we often wonder if Mr Mozart ever tasted the very earliest wines of our estate, while sat at his piano composing, taking inspiration from the taste. We like to think that he, once or twice, may have even wandered the now-hallowed halls of Château Micault, one of the earliest stately residences in the region. Beaune’s most famous building is also, coincidentally, the most fascinating and most beautiful. 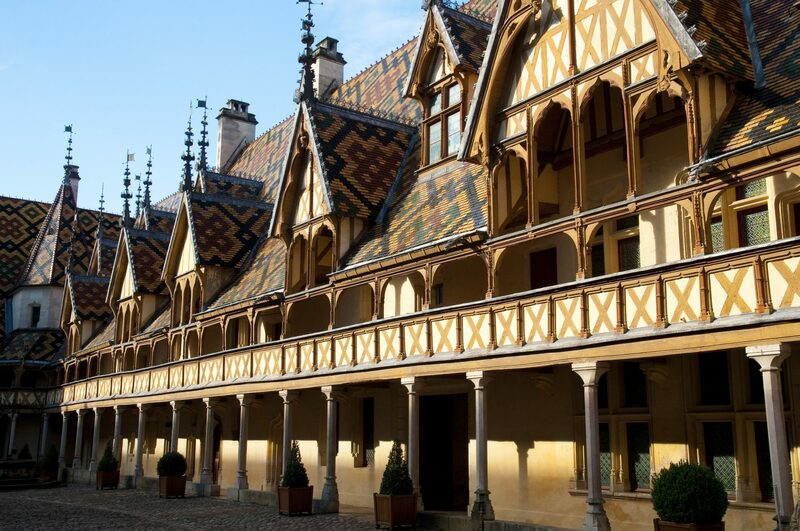 With its iconic polychrome roof and cobbled central courtyard, the Hospices de Beaune’s history and beauty can be found around every ancient corner. 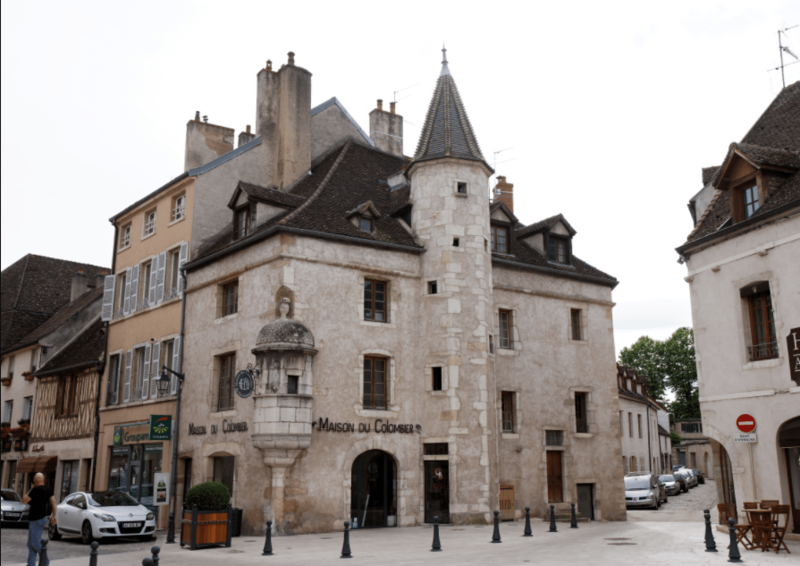 First built in 1443, by command of Nicolas Rolin and Guigone de Salins to build a hospital, one of the nation’s very first, the Hospices now functions purely as a historic center and museum throwing a spotlight on the building’s important purpose as a hospital in the 15th century. The Hospices de Beaune is also a wine estate, owning 60 hectares of appellations throughout Burgundy, donated to the charity every third Sunday in November for the Vente des Vins wine auction, the world’s most famous wine charity sale. F0r more details on Hospices de Beaune, head here. 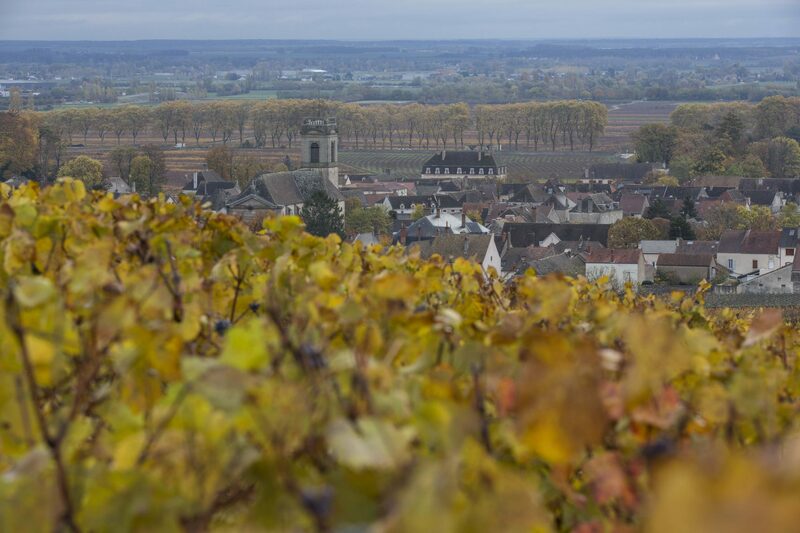 By land, by stream, or by air, there are many ways to discover Burgundy’s true beauty. Our favorite way, naturally, is by bike. 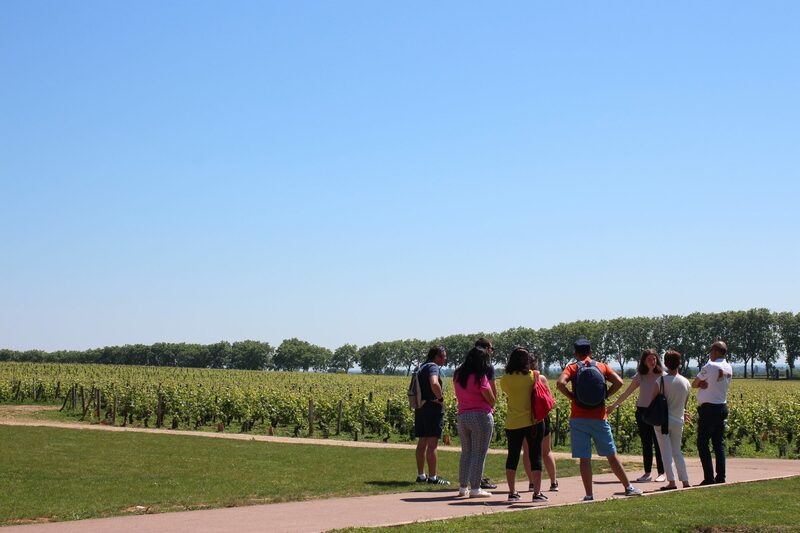 Cycling the Route des Grands Crus, and along the D-roads, is a popular way to get around and discover the different appellations in style, and allows you to leave the car at home. 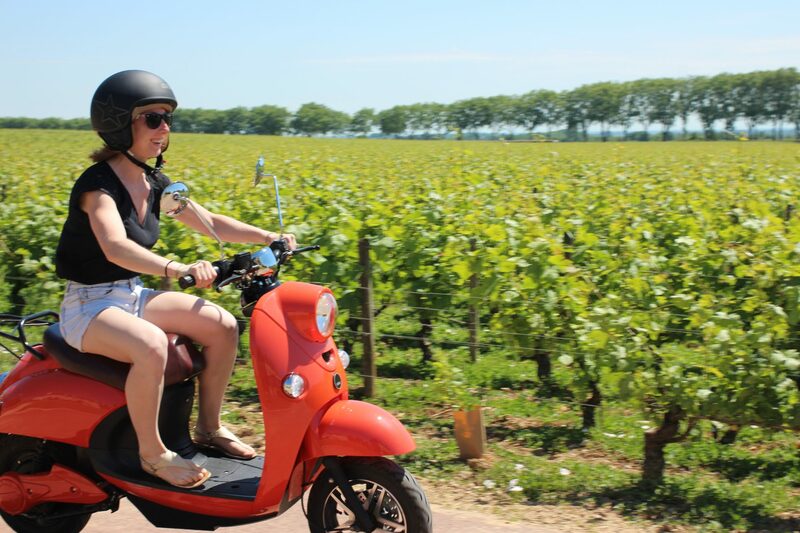 You can cycle around Burgundy in two fashions – 1) on your own, 2) as part of a guided Burgundy Bike Tour. We’ve enjoyed both and they are equally as much fun. Many serious cyclist groups and tours bring their own road bikes, and can often been seen spinning through villages in colourful spandex; but for those riders who just want a leisurely cycle along the Route des Grands Crus at their own pace, in their own time, bikes can be rented at many locations throughout Beaune. 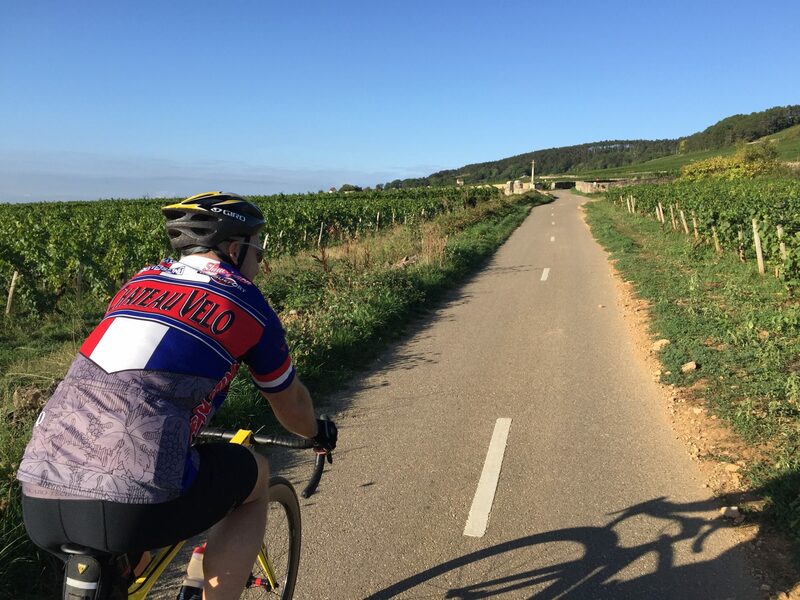 A triple time-tested route along the Route des Grands Crus, as well through the bumpy vineyard pathways, the D13A and D13B, is from Beaune to Puligny-Montrachet which, depending on your cycling speed and energy levels can take 90 minutes. A Tasting Menu of Chardonnay and Pinot Noir at Julien’s famous wine bar in Puligny-Montrachet is always a well-deserved treat for those who choose this route. If you go, tell Julien we say Hello! While it’s true, and fair, that Burgundy’s Chardonnay and Pinot Noir vineyards grab all the headlines for tourists and travelers to the region ; some small attention must be paid to the sunsets and sunrises that rise and fall over the vineyards. Because they are incredible. One of the central tenets to why the Côte d’Or is so blessed with fine wine and good fortune is due to the sun’s location. 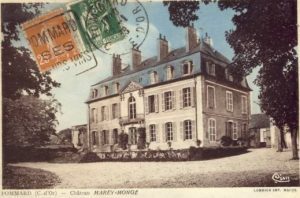 Many vineyards, including Clos Marey-Monge, face south-east allowing them to bathe in the golden orb’s goodness for longer. This also means that the sun rises in stunning style over the vineyard, granting photographers and sunrise hunters one of the best views on earth. Earlybirds who wake up to see this sunset will be rewarded. 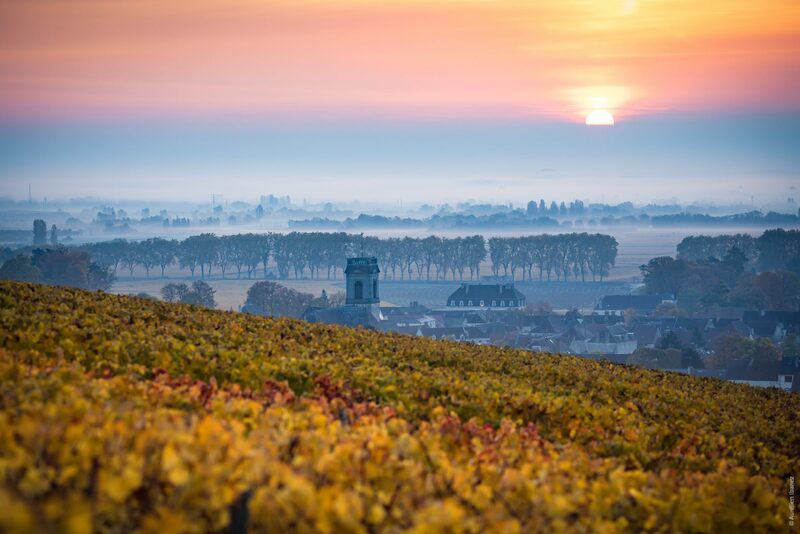 A revered spot to see the sun rise is in Volnay, the next appellation south from Pommard ; when a Panorama spot is signposted and delivers a gorgeous sun-soaked scene of the whole of Burgundy. Equally, sunset occurs behind the vineyard offer a spectacular view too, especially if you take a drive up into the hills of Pommard. Obviously, this is the No.1 thing to do during your stay in Burgundy. But, where? There are so many places and so much excellence to choose from. Sometimes, even to locals, it can be difficult decide which awesome wine to drink. 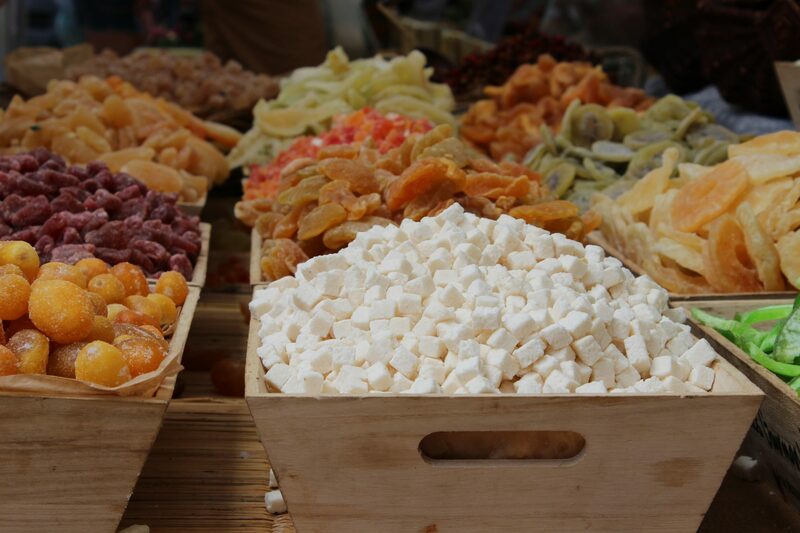 In Burgundy to you’re always spoilt for choice! There are, however, a few places around Beaune and Pommard that are perennial favorites of ours ; places that we like to give a special mention. Maison du Colombier, on Rue Charles Cloutier ; and La Dilettante, on Rue du Faubourg Bretonnière, are two of our regular spots for post-work wine and evening meals. 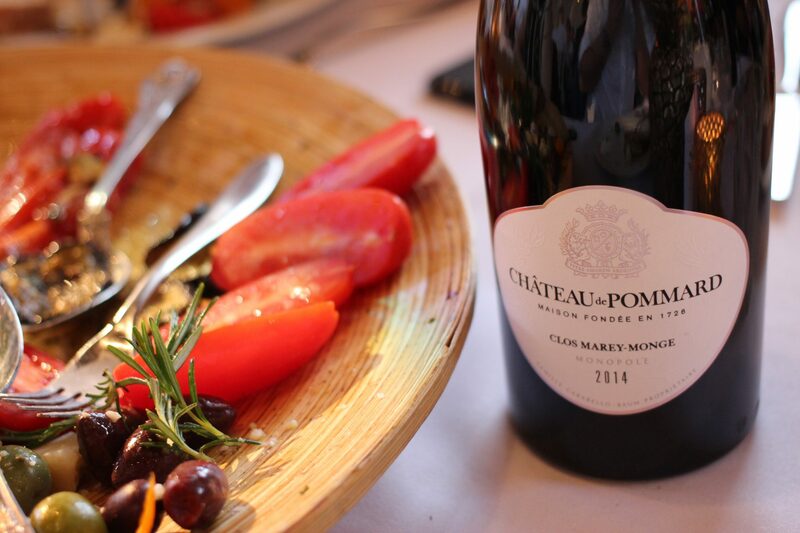 Clos Marey-Monge Monopole pairs well with anything if you ask us! 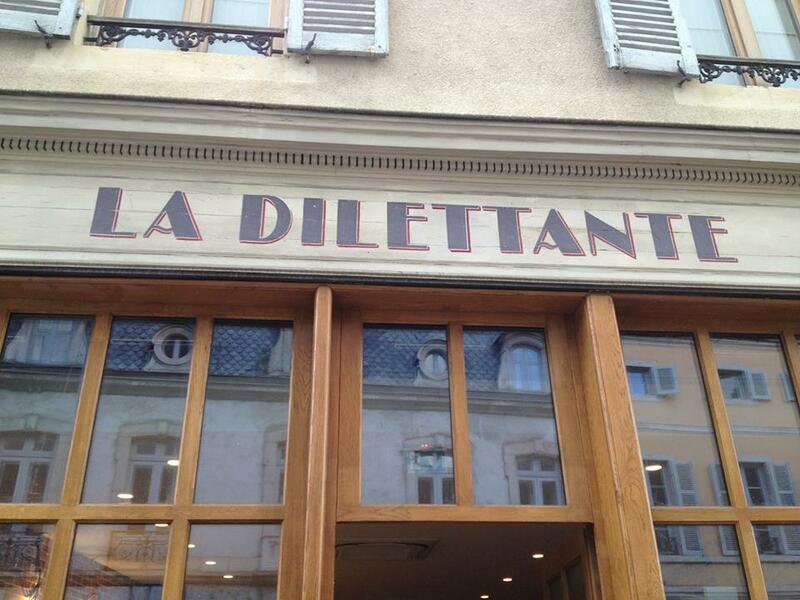 The Croque Madame at La Dilettante is to die for. And the Oeufs Meurette, a true local dish of eggs in white wine, and the wine selection at Maison du Colombier is as comprehensive as it the architecture. 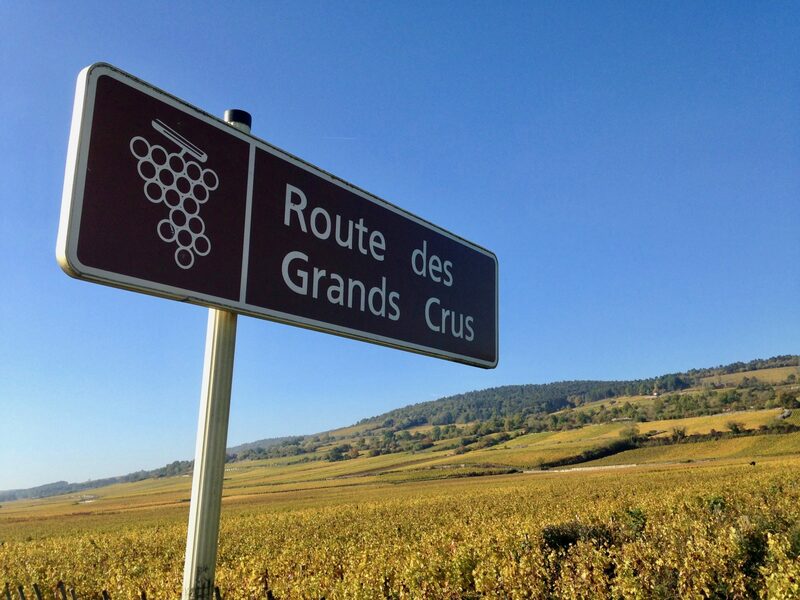 2017 is the 80th anniversary of the Route des Grands Crus, and there have been many events to celebrate its birthday. From Rootstock 2017, Château de Pommard’s first music, food and wine festival, to Les Mois des Climats, a month-long celebration of arts and events paying homage to the world’s most famous wine road. 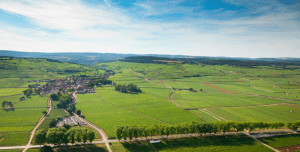 Along this iconic route, cyclists, hikers and wanderers can leisurely walk from one famous Burgundy appellation to another ; soaking up the devastatingly attractive scenery. 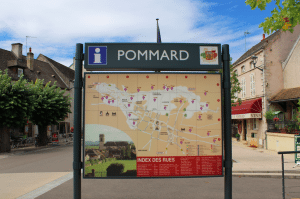 Beaune to Pommard is one of the most enjoyable walks. Not least because Château de Pommard will welcome you for a glass of wine at the finishing line, but also the vineyard vistas along the way are unforgettable. And because it’s only three kilometres between both destinations, the walk should only take as long you schedule allows. North of Beaune, approximately a 15-minute drive from the city, is Pernand-Vergelesses, one of the most scenic spots in all of Burgundy. Follow the narrow dusty paths up the famous Corton Hill ; past the houses with the polychrome roofs and all the way at the top of the hill you’ll find Notre Dame de Bonne Espérance. It is a monument that overlooks a view your eyes will never forget. It’s the perfect place to enjoy a picnic, cook up a BBQ feast, drink a glass of wine with friends and stargaze. The view below says it all.. Harvest always ends, usually after about 10 days. At that time, many tourists and travelers head home. But, there are also many passionate Burgundy lovers who arrive at this time too. Because, as we all know, every season is Burgundy is worth watching. In late October, early November, when the vines have stored enough carbohydrates to see them through winter hibernation ; the leaves transform from luscious green to brown, and finally, golden – just before they fall. It’s a sight to behold and gives the Harvest season a good run for its money when it comes to which time is most spectacular. 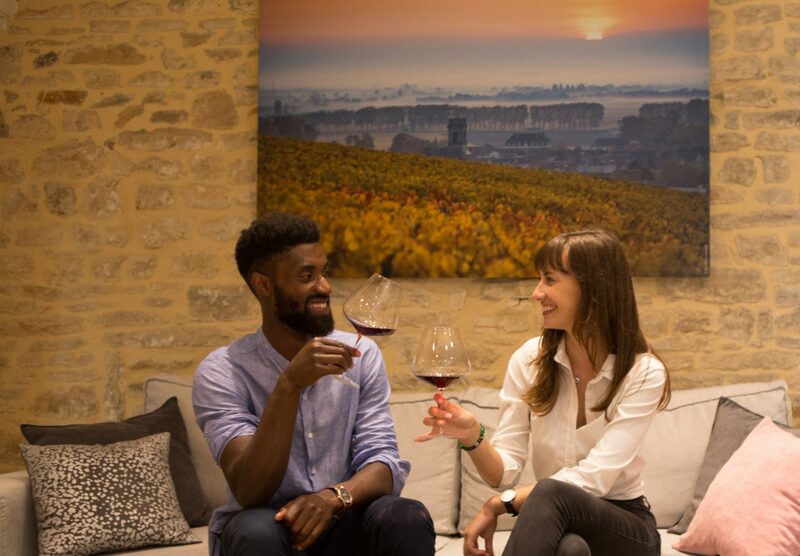 While it may be quieter in October and November, with less tourism and traffic ; there are still many events on the social calendar to draw people to Beaune, and its surrounding appellations. So, if you can’t make Harvest this year, don’t worry. Burgundy remains alive with life throughout October and November and is always ready and willing to pour you a good time. Consider this your invitation!